Soak about 12 wooden skewers in water at least 1 hour before using. In a small bowl, mix together coriander seeds, paprika, salt and pepper. Place beef cubes in a large resealable plastic bag. Add spice mixture and shake until beef cubes are completely covered. Set aside. While beets are steaming, heat grill to medium-high and make Cilantro Feta Sauce. Thread skewers with 2 to 3 pieces of beets and beef. Brush kebabs lightly with oil. Place directly on grill and cook each side 4 to 5 minutes until beef is pink in the center and beets are charred on the edges. (You may also use a grill pan on the stovetop.) Remove from heat and let rest 5 minutes. Slice beet greens into 1/2-inch strips, toss with olive oil, and season with salt and pepper. Serve kebabs on a large platter with Cilantro Feta Sauce and greens on the side. Place feta and its brine, garlic, and olive oil in a small food processor. Pulse until thick and creamy. Stream in milk or water until dressing is thin enough to coat the back of a spoon. Fold in cilantro. Place in a container and refrigerate until ready to serve. Switch up the kebabs by using pork tenderloin or chicken. 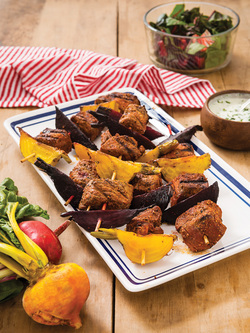 Add in wedges of orange, too, for a bite of sweetness and color—squeeze the orange over the kebabs just before eating.